When it comes to driving a mid-size sedan with more tech, more features and more power, competitors like Hyundai Sonata and Volkswagen Passat simply don’t match up to the new 2018 Mazda Mazda6! 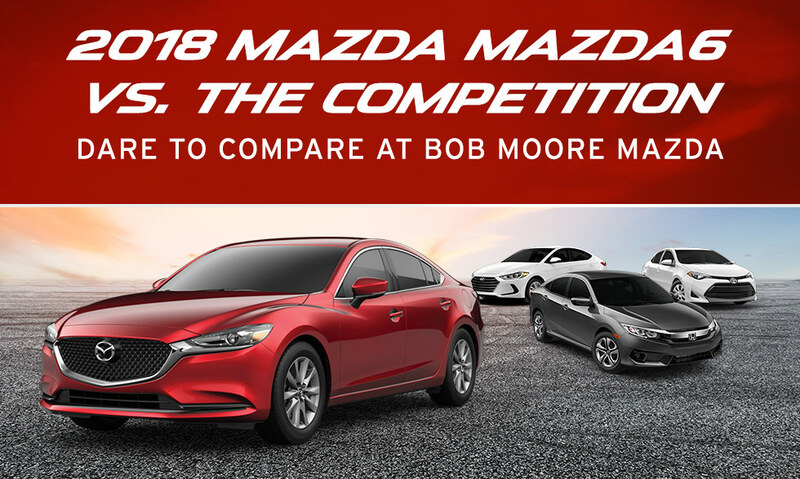 Visit Bob Moore Mazda today and experience the new 2018 Mazda Mazda6 for yourself and you’ll see why more drivers are choosing it over the competition. The 2018 Mazda Mazda6’s stylish exterior not only looks great, it’s also aerodynamic. This gives the new Mazda6 the ability to improve fuel-efficiency for better performance on Yukon roads and Oklahoma highways. Plus, the 2018 Mazda Mazda6 gives you the versatility to choose your performance. Pick the Sport and Touring trims for up to 187 horsepower and 186 lb.-ft. of torque and the freedom to pass by the pump thanks to an EPA-estimated 35 MPG highway! For more power, choose the Grand Touring, Grand Touring Reserve and Signature and you’ll be on your way to up to 250 horsepower while still giving you an impressive EPA-estimated 31 MPG on the highways of Oklahoma. The 2018 Sonata, on the other hand, can only muster up to 245 hp in a comparable engine and only up to 185 hp in its baseline trim. The Passat doesn’t do very well either, with a maximum horsepower of only 170 hp and 184 lb.-ft. of torque. Get behind the wheel of the new 2018 Mazda Mazda6 and discover a driving experience like no other. With a suite of drive-centric features, the Mazda6 delivers maximum information with the least possible distractions. Its exclusive MAZDA CONNNECT™ Infotainment System with navigation and SMS text message audio delivery and reply, keeps you connected and focused on the road ahead. You won’t find this tech in the 2018 Passat or the 2018 Sonata. The Mazda6 even offers a rearview camera that can help you back up safely and quickly. Not only is the 2018 Mazda Mazda6 an IIHS.org Top Safety Pick+, it has also been awarded a 5-star rating by the NHSTA. That means peace of mind comes standard always. Every 2018 Mazda Mazda6 was designed with you in mind. All its innovative tech is at your fingertips to ensure you arrive where you need to go as safely as possible. Test Drive Your Mazda6 Today! Still thinking about the Hyundai Sonata or the Volkswagen Passat? We didn’t think so! Stop by Bob Moore Mazda today and test-drive the new 2018 Mazda Mazda6 and experience all it has to offer! We proudly serve drivers from Oklahoma City, Edmond and Guthrie!